Cummins then uploaded her manipulated documents to the internet to spread her venom far and wide through numerous blogs and Facebook posts. Cummins tries to represent herself as “an advocate for animals” and “a whistleblower” by continually posting this false and misleading information even after she was sued for defamation and ordered to pay Bat World Sanctuarty and Amanda Lollar in excess of SIX MILLION DOLLARS. In a document received via a Freedom of Information Act request (FOIA) we have uncovered yet another example of the maniacal intent of Mary Cummins of Animal Advocates (a decade-long suspended non-profit in the state of California), towards Bat World Sanctuary. In one tactic, Mary Cummins repeatedly posts an email from a USDA veterinarian (Dr. Laurie Gage) charging Amanda Lollar with “violations” among other things. 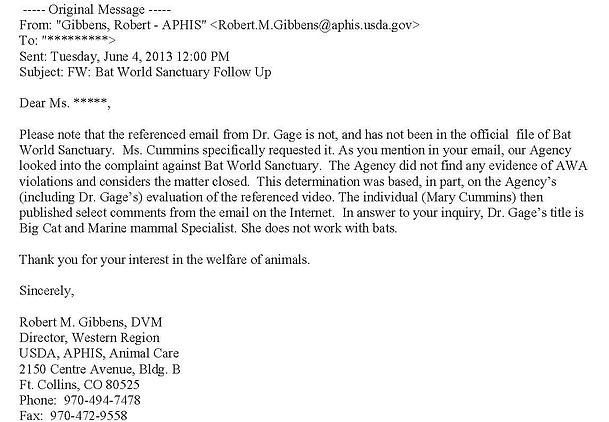 The letter that Gage wrote was in response to a manipulated video that Cummins sent to the USDA in retaliation against Bat World Sanctuary after we sued Cummins. Dr. Gage made her comments about the video based on the manipulated portions she viewed. However, it has come to light that Dr. Laurie Gage is LINKED to Cyber-stalker Mary Cummins through a mutual friend, Dr. Jennifer Conrad. Mary Cummins has identified Dr. Conrad as her ‘best friend’ who likes to take Cummins on trips to Spain and various other outings. Jennifer Conrad was a classmate of Laurie Gage and they both work on big cat related projects together. Did Dr. Laurie Gage, the USDA Big Cat and Marine Mammal Specialist, collude with Mary Cummins and sidekick Dr. Jennifer Conrad to help Cummins out of a lawsuit? It is highly suspicious that Mary Cummins knew to ask for a specific email that was not even in Bat World Sanctuary’s file, and she asked for it repeatedly until she received it. It’s important to also note that after the numerous false complaints made by Cummins, Amanda Lollar willingly submitted to numerous government investigations, including a 5 hour legal fact-finding by the USDA. Every complaint Cummins made was found to be baseless. Learned professionals from every bat inhabited continent in the world have sought out and been trained by our Founder. Literally millions of bats lives have been saved due to Amanda Lollar’s intervention, which made Mary Cummins relentless defamation of our sanctuary even more damaging. After Mary Cummins was sued, two veterinarians testified in court for Amanda Lollar (Search the trial transcript for “Dr. Jarrett” and “Dr. Messner” to read their compelling testimony). It is unfortunate that the USDA had a “Big Cat and Marine Mammal Specialist” review anything whatsoever concerning a bat sanctuary. Any bat trained veterinarian or even a veterinarian specializing in wildlife and exotics would not have been fooled by the altered video. Since Bat World Sanctuary and Amanda Lollar’s name was cleared by every single government agency and animal rights organizations, Bat World is listed as the NUMBER ONE sanctuary to which people should donate. This is a prime example of why people should fight back when they encounter a cyber-monster and they are being cyber-stalked, cyber-harassed and defamed. In hopes of helping others who have been or are being cyber-stalked/cyber-harassed, we have created a Facebook page, Stand up to Cyber-Stalkers, to help others regain control of their lives including tactics to fight back. Many people have credited the page with changing their lives for the better. Mary Cummins, of “Animal Advocates,” is mentally troubled, obsessive, vindictive and relentless. The above information shows the lengths Cummins will go to in order to cause damage to an all-volunteer organization that relies solely on donations to save animals. For additional information about Mary Cummins see this link.